As a child, the enamel of your teeth was naturally white. This changes as you age, usually due to lifestyle habits and food choices. Most people realize that smoking or drinking heavy amounts of coffee or cola can cause the teeth to gradually turn yellow. Other common reasons for the discoloration of your tooth enamel include hereditary, poor oral hygiene habits, eating foods or drinking beverages dark in color, or taking certain medications. 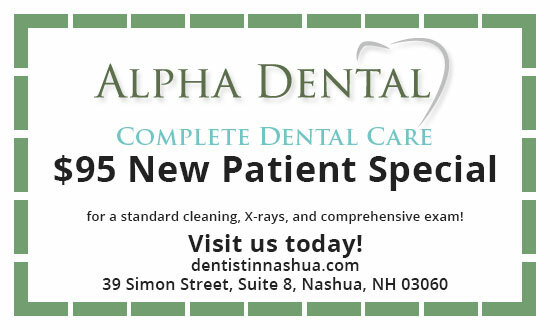 When you visit Alpha Dental, we will provide you with a guide to whiten teeth. Teeth whitening services typically takes two sessions of professional teeth whitening for you to see the results you desire. During your first appointment, Dr. Ahmed places a special dental putty in your mouth to take an impression of your upper and lower rows of teeth. He then sends the molds to our dental laboratory so our technicians can prepare your customized mouth trays. We will call you in for a second appointment when your trays are ready. After ensuring that your mouth trays fit properly, Dr. Ahmed fills them with a bleaching gel to prepare for the whitening procedure. He first places a device in your mouth that keeps your lips off your teeth so they do not leave any saliva on them. Once he has completed both of these steps, he places the filled trays in your mouth and asks you to remain seated with them in for up to 45 minutes. For the last step, Dr. Ahmed removes the trays and uses a curing light to encourage faster brightening of the deepest layers of dentin. It used to be that only movie stars and others with highly visible roles had teeth whitening performed by their dentist. This procedure has become increasingly popular over the years to the point where nearly anyone who desires it can have it done. Schedule your consultation today to learn more.